Custom trellis stained Benjamin Moore Yorktowne Green HC-133 are supports for espaliered apple trees and a backdrop for a small deer resistant perennial bed. could you tell us what stone/product was used for the edging and how it was installed? thanks! Can you tell me what color was used for the lattice? And does it come in a stain? Benjamin Moore Yorketown Green opaque stain. Is this a wood or vinyl trellis? Thanks! Who makes the trellis and where can it be purchased? Vertical panels in a square lattice pattern protect a side yard from view. I love the beefy posts and lathing as well as the dark teal stain, making this solution people and plant friendly. For those within this space, it's nice to glimpse neighborhood activity on the sidewalk or street without feeling exposed. The espaliered fruit tree on this trellis is more vertical than horizontal, giving it a slightly different look than the previous espalier. A trellis like this will work equally well to support berries or beans. If it's sturdy enough, consider using it to encourage smaller squashes, cucumbers and eggplants to grow up rather than sprawl outward. You'll protect the crop from insects in the soil, not to mention marauding pets and children. You'll also have a living privacy fence during the growing season. 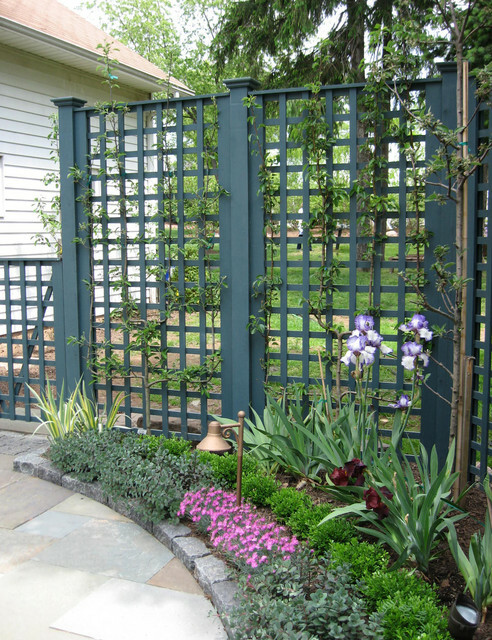 A trellis can be a simple frame with latticework panels. The curved border gave her the opportunity to fit in more gardens against the corner of the trellis. Sedum, dianthus and iris add color and texture, while more of the low-growing boxwood lends a continuous feel from one side of the patio to the other. Standard gray Belgian block reinforces the edge just slightly above patio grade.